In my previous article, I talk about "Text Tokenization" on English language where we can use existed library to do the job with ease. 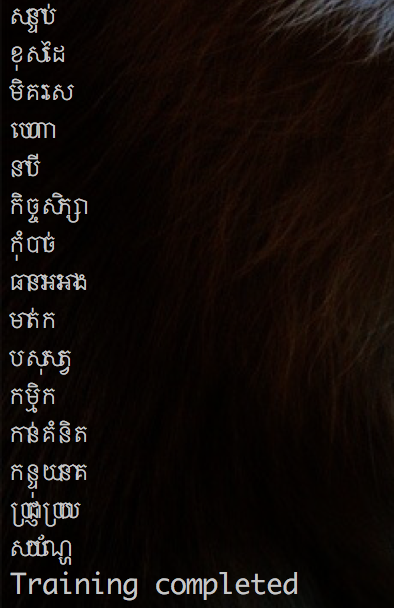 Unlike other languages, Khmer Word Segmentation is way more complex. Because the Khmer language does not have any standard rule on how we are using space to separate between each word(space are used for easier reading). Moreover, Khmer word can have different meaning with the order of words when it will form. Khmer word could also be a join of two or more Khmer words together. Because of uncertain rule of spacing and the complicated structure above, which it is hard to segment Khmer Word. In this article, I am going to a simple yet powerful data struture trie to apply on Khmer word. As we all know, we need to fit our trie data structure with the array of words. Then we can use the model to find/split words from given sentences which we can apply "Text Tokenization" on. So we need to find a list of Khmer words. Luckily, I found a repo which contain list of Khmer words. However, we need to write few line of code to prepare those list for our trie model. First we convert tsv format to txt format where later we can use it to fit our trie model. As you are notice, we need to inform and encoding our Khmer string to utf-8. Let's run the command to read tsv file and save it as txt. Here we read the txt file where we prepared above to train our trie model(Let's assume you already have already built trie class). Then run the code to train and store in pkl file for later use. Next, we test our trained model and some of trie methods. We have collected Khmer words from many public data sources. We then prepare those words and train them in our Trie model. However, the text data from those public data do not container all Khmer word. So next step, we are going to fit code with the given sentences of known and unknown words where we can store those unknow words and use them to improve our model.